It is “self-evident” that reflection is a part of inquiry-based learning. One is given this impression as soon as one looks into descriptions of the concept: In the first list detailing the features of inquiry-based learning, which was created by the Federal University Assistants’ Conference (BAK) (1970, paragraph 4.21), we already find the following: “self-critical examination of the outcome in terms of its dependence on hypotheses and methods.” The term is included in definitions, for example in the oft-cited definition from Huber (2009, p. 10, translated):This same impression is created by models of the phase cycle that inquiry-based learning should ideally undergo, not only as described by Huber (2009, also in the definition provided above), but also, for example, by Joachim Ludwig (2011): In each of the three types of “teaching in the format of research” distinguished by Ludwig (research-based, research-oriented, community), which accentuate different parts of such a cycle, reflection appears to be a central aspect. 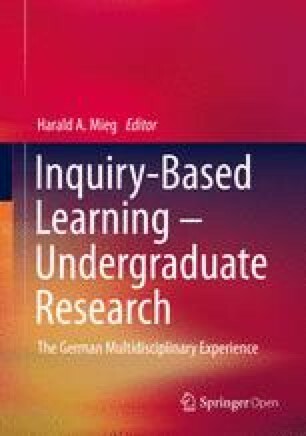 Schneider and Wildt (2009) formulate their “process model of inquiry-based learning” in a manner that is explicitly analogous to Kolb’s experiential learning, in which reflection of experiences gained acts as the starting point for new questions and hypotheses. Accordingly they define phase VII (after the phases of carrying through the research and evaluating the research results) as “interpretation of the data, reflection on the research process.” The words “reflection” and “to reflect” are also frequently found in reports on inquiry-based learning projects that have been conducted (cf. Huber et al. 2009, 2013; Lepp and Niederdrenke-Felgner 2014).